My trusty chariot for the road trip. After my date with the Northern Lights, I was eager to hit the road again, heading west to Jökulsárlón, the glacial lagoon on the border of Vatnajökull National Park. When I first left Reykjavik, I wasn’t sure if I would have time to make it to Jökulsárlón, but with the success of the previous day, I decided to attempt it. After all, when would I have the chance again? I’d really lucked out on the weather for the Golden Circle—my next driving day was decidedly grayer, but it was still an atmospheric and scenic journey. Just as a note of caution, though—there’s hardly anything between Vík and Skaftafell National Park, which has a nice visitor’s center. Make sure you have a full tank of gas when you leave Vík. The landscape changes dramatically along the southern coast. 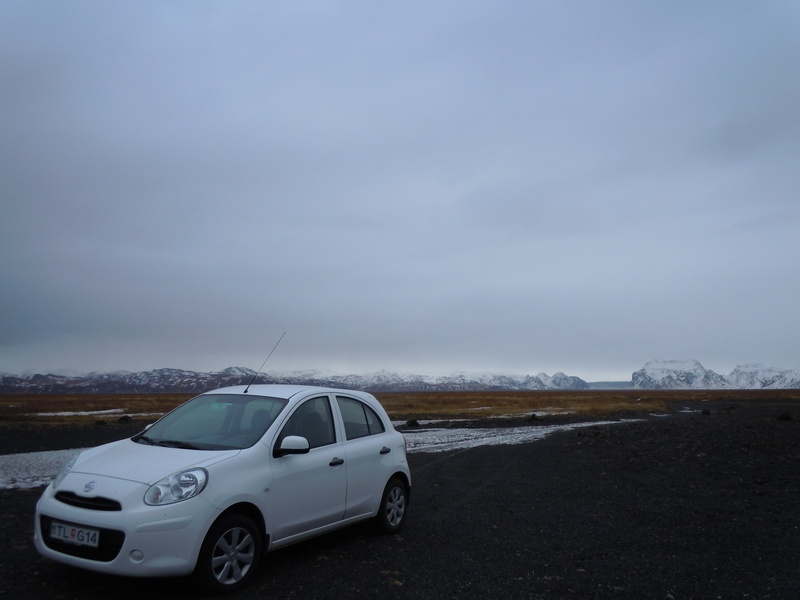 Though I left the black sand beaches, the next hour of driving saw vast plains of volcanic sand tufted with sea grass, lightly dusted with snow from the night before. The rock I left. It’s bad luck to disassemble a cairn. I pulled over at Laufskálavarða, an almost eerie place—hundreds of cairns dotted the area, with more concentrated on the small lava mound that stands sentinel in this flat place. A sign gives an explanation: apparently a large farm was located on this site but was destroyed during Katla’s first eruption in 894. 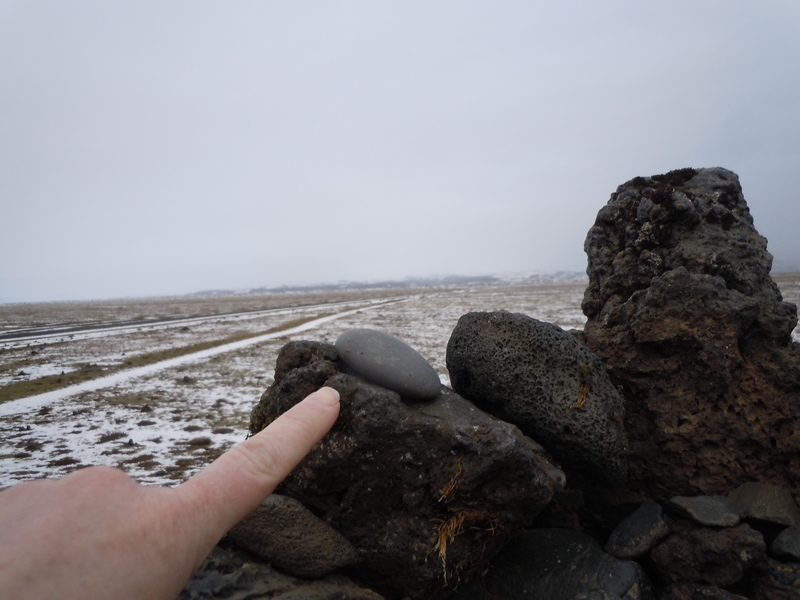 The lava mound, which is called “Laufskálar Cairn,” was named after the farm. Everyone passing by is supposed to leave a stone for good luck on the journey. I left my rock and moved on. Then the waterfalls reappeared as the road skirted closer to the mountains. I bypassed Kirkjubæjarklaustur, one of the few towns in the area, as I still had quite a bit of ground to cover. I did enjoy the various signs that I found along the road, detailing various folktales and explanations for certain rock formations. The sun peeped through the clouds and I got my first glimpse of Vatnajökull, Europe’s largest glacier. 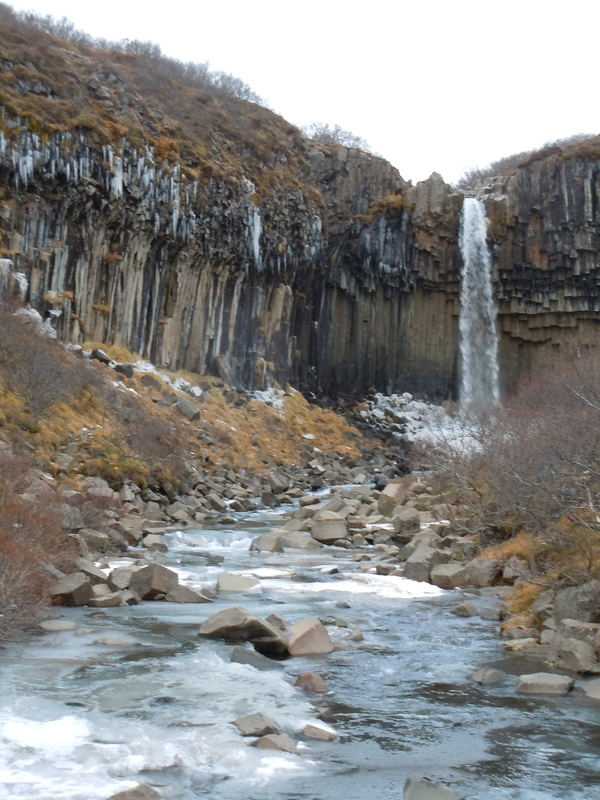 I headed into Skaftafell National Park and took a quick hike to Svartifoss, the black waterfall. It’s a nice hike, not too strenuous. It takes about 30 minutes to reach Svartifoss, 45 minutes if you take copious amounts of pictures. Don’t get distracted by Hundafoss, which is on the way. It’s not a huge waterfall, but there’s an opportunity to get right up to the edge, which is nice unless you suffer from vertigo. The views from the top are expansive, both of the glacier and the surrounding plains. The waterfall is quite unique, with the black hexagonal basalt columns that reminded me of the Giant’s Causeway in Northern Ireland. I sat for a short while, enjoying quiet and the crisp air at the top. Back at the car (with a hot coffee in hand), I hurried towards my ultimate destination. The clouds were definitely rolling in and I knew that I had quite a bit of driving to return to Eyrarbakki, where I planned to spend the night. Jökulsárlón is about 45 minutes from Skaftafell and there are great views of the glacier from the highway. I had to stop at one point when I saw a Jeep coming from the south over a field, crossing the highway–and then I saw a herd of sheep close behind. And then another Jeep, following the sheep. Jeep herding. Or Jeep sheep herding if you will. Definitely a first for me. Anxiously looking for Jökulsárlón, I started noticing areas marked for parking, but there were no cars. I continued on and, before heading over a bridge, I could see the glacier lagoon on my left and the ocean on my right. The main parking lot and information hut are located close to the lagoon; I can see as how you might need additional parking on a busy day, but at the moment I was the only person there. The lagoon is massive and there are opportunities to hike around the perimeter; I started up a small hill and got my first panoramic view. Ice chunks on the shore of Jökulsárlón. It was breathtaking, in all of the ways that word is overused. 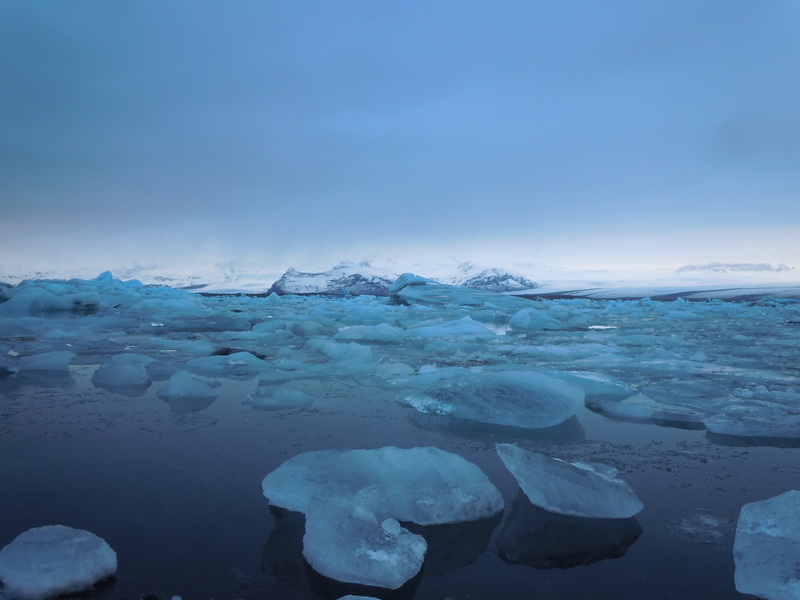 The hunks of ice were active, some moving quite quickly through the lagoon towards the ocean. The lowering clouds highlighted the electric blue of the ice; I imagine it would look quite different in bright sunlight. A seal popped up for a moment, then continued on his way amid the cracking and moaning of the ice. I headed over to the ocean side to get another vantage point of the lagoon; the beach was just as spectacular. Where you might see giant rocks on another shore, there were massive hunks of ice buried in the sand. Waves crashed on the ice and I noticed snow flurries starting to collect on the black sand. It was time to go. I left Jökulsárlón wishing that I had more time, but I was so glad that I had taken the chance and traveled there–it was truly one of the high points of the trip. The snow started falling heavily and I had to proceed slowly as the highway wasn’t plowed. Luckily, my rental car had snow tires so I was fine, though I have to admit that I was mighty glad that I had payed a bit more and gotten a reliable car. My plan was to stop in Eyrarbakki for the night, a small fishing village on the east coast not far from Reykjavik with a recommended restaurant and a hostel where I could stay. This didn’t exactly work out the way that I planned as the hostel, which advertised that it was open year round, was closed. Crap. I decided to try out the restaurant as it was the reason that I had detoured there. Rauða húsið (Red House in Icelandic) started off on a bad foot for me as my GPS led me to a “red house” down the street from the real restaurant A dilapidated peeling red house that looked like it hadn’t been occupied in years. It was dark, my stomach was complaining mightily and I was about to chuck it and try to find a Subway (that was how desperate I was) when I saw the real restaurant down the road. It was a nice place–white tablecloths, candles, etc.–but the food didn’t blow me away. Maybe I ordered the wrong thing, but the pasta was overcooked, swimming in sauce and way over-salted. I picked out the lobster, which was excellent, and used their phone to call the hostel in Selfoss (about 20 minutes away) to make sure I had a place to sleep. Questionable art at the hostel. Someone took the time to needlepoint this. Turns out, the folks that run the hostel in Eyrarbakki also run the one in Selfoss. Of course. I had a single room, though, and turned in for a quiet night with my bottle of Ölvisholt Vatnajökull Frozen In Time beer, brewed from glacier water and wild thyme (purchased at the information hut at Jökulsárlón). I tried not to think too much about the choice of artwork hanging on the hostel walls. Next morning: up early and back to Reykjavik to turn in the car before my 48 hour rental window closed. Tags: glacier lagoon, Iceland, Jökulsárlón, Skaftafell, svartifoss, waterfall. Bookmark the permalink. I also found it surprising how little there is between Vik and Skaftafell. I keep thinking I need to open a restaurant in Iceland! You were very effective. Fine that you made to Jökulsárlón. It’s a stunning place.